In brief. David Ing. | A microblog. Also opening of Reading Faces, Reading Minds art exhibition at the Bissell Building. 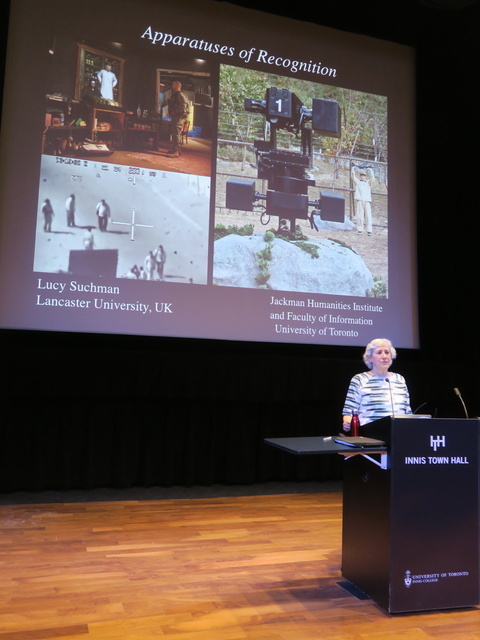 Lucy Suchman, Professor Lancaster U.
Interpretative manoeuvre, who is a target? Any good news? This is depressing. Any evidence (China, Russia) taking a different approach? Surveillance to be used for good, and not evil? Collateral damage. 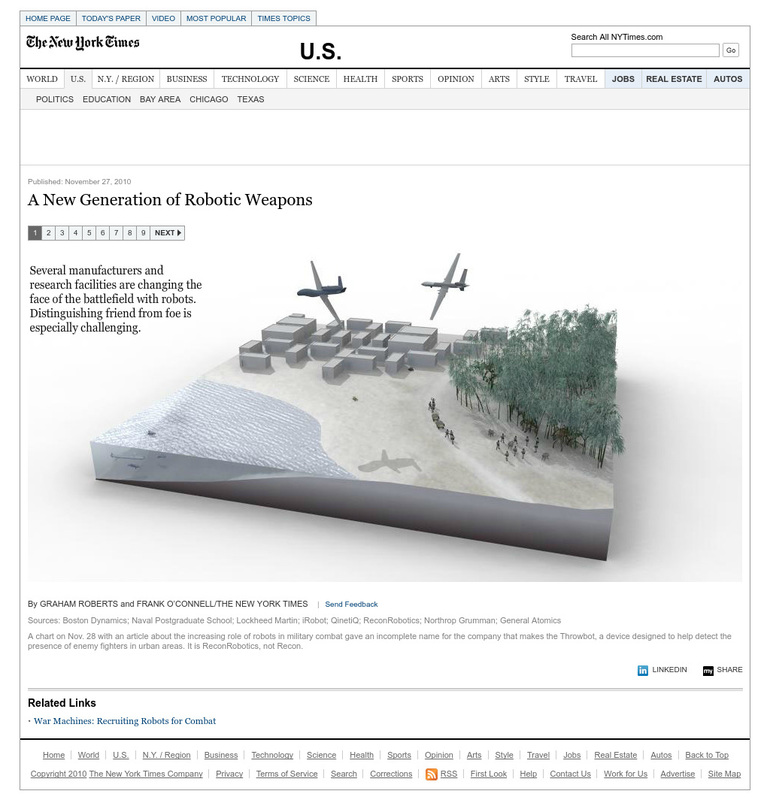 Forensic architecture doing similar things, working within legalistic. Any legal consensus on humans being held accountable for autonomous? Is it the software developed? The operation commander? Have been in meeting with senior military officer about lethal autonomous weapons, said that he wouldn’t deploy unreliable. A lot of pushback, but accountability is messy. What forums do we have to pursue those questions? Criteria of recognizability, and achieving discrimination makes killing by algorithm or autonomous weapon illegal. Human killing also becomes a form of illegal. Undermining AI, undermines entire appartus. Counter-argument of threshold of reliability? Recognizability won’t work. A sense of the backup to the argument, to protect against a sufficient threshold of reliability. Not sure what that looks like. Rule #1 of IHL is clear. World of irregular warfare, has undermined that. International law as reasonable to limits to armaments? Big contracts. Protecting from external threats. Naive to think laws will limit. Questions on efficacy on the rule of law. Come less from the idea of real threats, than military-industrial complex, deep and invested interests in militarism. Don’t want to see rational actors, reject that description as inevitable. Has research taken you to what would happen in the U.S., when there aren’t funds available to do this work. Diversion of funds from education to military. Social chaos. How long can this continue in the absence of revitalization of domestic education and health? A political struggle, from the street to congress. Important to interrupt the assertion that the U.S. is engaged in necessary defence. This could be regarded as controversial, but for a reason which will soon become obvious, this author chooses to follow Kurtz, 2011 which gives a detailed discussion of the search among Chinese scholars during the last hundred years or so for fragments of texts which could be used to support the claim that Chinese philosophy or must have developed logic in the European understanding of that term as formal logic. The operative phrase is “the European understanding of that term as formal logic.” as it is clear that (ancient) Chinese philosophers had an interest in logic—it was just that their pre-occupation with it was not expressed in the same way as European philosophers (since ancient Greek philosophy) had/have pursued the subject as formal logic. 1. Why did the Chinese not engage with formal logic? The Contextual mode of thinking is key to understanding how their philosophy and world-view were shaped. 2. The distinction between dyadism and dualism: the Chinese mode of thinking is dyadic, not dualistic as modem Western philosophy is. 3. The ancient Chinese operated with an implicit logic, which may be called Yinyang/Yao-gua logic. 4. Two-valued and many-valued logic; classical logic in the West is two-valued, while it could be argued that embedded in Yinyang/Yao-gua metaphysics and its model of thinking is an implicit logic which is many-valued. The latter two points extend into “implicit logic“. For these excerpts, let’s focus on (1) the contextual mode of thinking; and (2) dyadism and dualism. It is not an exaggeration to say that contextual thinking  was/is truly foundational to Chinese thought, laying down the framework in which Yinyang/Yao-gua thinking and what this author calls Yinyang/Yao-gua implicit logic were to be understood. So what is contextual thinking in the ancient Chinese context? Let’s skip past the deep reading in The Zhuangzi, forward a few pages. The Contextual Mode in general amounts to this: the two values, truth and falsity, have no proper application in the abstract or vacuum — they only have application and meaning relative to a particular context, They are context-bound. The two instances of female beauty cited above make clear this point—they embodied beauty in the human context. If the beholder were not a human, but a fish, a bird, or a deer, they would even be repelled by such a sight which would inspire in them fear and flight. It makes no sense to discuss beauty or ugliness (truth or falsity) in a vacuum, free of a particular context. These values, even in a human context, would not necessarily yield fruitful discussion unless the disputants are fully aware of the context in which the claim of beauty, say, is made, and when the contexts are made clear, the dispute would lose purchase as each side would have realized that it would be futile to continue to maintain that only one’s own candidate for beauty/truth/falsity constitutes the winner, while rival claims are the losers. For instance, the paradigm of female beauty in the Tang was very different from that of the Song Dynasty just as the paradigm of female beauty today in the modem world (as displayed by models along the catwalk) is very different from that of the Renaissance period in European history. Focusing on context renders the respective criteria or standards used by the disputants in contesting their case visible and obvious. These criteria may be incommensurable—if the most significant criterion for determining female beauty is to be thin as a rake for Party A but to be as amply endowed as a Tang or Renaissance lady for Party B, then it becomes obvious that argument is fruitless. Of course, this is not to say that all disputes entail incommensurable criteria or standards. Whether a dispute does or not itself involve incommensurability depends on the context of the dispute—this is indeed the key thing to grasp about the Contextual Mode of Thinking. In turn what is the key implication of the Contextual Mode? It is this: its incompatibility with formal logic, whether as traditional syllogistic logic or as modem propositional logic since the twentieth century, as the latter implies the intelligibility of studying relations between assertions looked at solely through their formal relations as extreme abstractions, with no reference either to content or to context. In contrast, in evaluating an argument, the ancient Chinese were interested not merely in the concept of validity but also in the truth of what was said. For them, as the passages from the Zhuangzi make clear, they held that truth depended on context, that truth could not be understood in abstraction or extrapolation from the context in which the assertion is embedded. Hence from the standpoint of the Contextual Mode, a project such as formal logic would be absurd, impossible, fruitless, and pointless. Hence the ancient Chinese had steered clear of it. This is the most important conclusion to draw from the brief discussion here of the Contextual Mode of Thinking as the over-arching mode in ancient Chinese thinking. The next section deals with an embellishment of this fundamental mode of thinking, marrying it to dyadic as opposed to dualistic thinking. The section, which follows it, will then explore more fully the implications of what this author calls the Contextual-dyadic Mode for logic in Chinese philosophy. One particular example of the presentation of syllogistic logic in an introductory text of the discipline would look like this: All Ms are Ps; S is M, therefore, S is P. This argument is valid because it satisfies the rule that the middle term (M) is distributed. One does not need to know what the terms, M, P, and S stand for or refer to, as formal logic is not interested per se in truth, but only in validity. That covers context. However, in order to appreciate dyadic thinking, we first need to understand dualistic thinking. To put things baldly, ancient/traditional Chinese thinking is dyadic whereas European/Western/modern thinking is dualistic. Unfortunately, the distinction cannot be spelled out in a sentence or two right at the beginning of this exploration, but suffice it to say here that both forms of thinking deal with terms which constitute polar contrasts but which each respectively understands in very different ways. A slightly more elaborate schema is shown below about dualistic thinking. 1. What is to the right and inferior and subordinate to what is on the left of each level; what is to the right is inferior and subordinate to what is on the left within each subdivision at each level. 2. Each level is subordinate to the level above it, such that ultimately all levels are subordinate to God in the religious/Christian version, although in the secular version, God drops out of the scheme. 3. What is on the right at each level (and each subdivision at each level) either has less or no value in themselves (no intrinsic value). 4. The religious as well as the secular versions are both compatible with extreme anthropocentricism (the view that only humans have intrinsic value and non-humans only have instrumental value for humans (see Lee, 1999, for details). 5.. In other words, 1 through 4 above imply that dualistic thinking is hierarchical thinking. As such, it is ideological thinking writ large, either designed intentionally or co- opted wittingly/unwittingly to entrench a political (in the wider sense of the term) order, celebrating unequal power relationships. In such pairings, the higher/superior class denigrates the “Other;” the two categories are not purely factual or empirical in character, but are heavily impregnated with moral/social meaning and significance. For instance, the human male is not simply a human being born with a certain kind of reproductive organ system, just as the female is not simply a human being born with a different kind of reproductive organ system. 6. It is Reductionist thinking—the inferior member of the pair is but an appendage, a mere shadow of the superior member. In the case of humans, the latter enjoys the status of being the epistemological/methodological authority, laying down criteria for what constitutes a “proper”/“good” specimen of the former. Feminism complains bitterly on these two fronts. Historically, in the Mind/Soul and Body pairing, the former was privileged this held true in Christian theology; in Descartes’s view, this remained true, thereby releasing the Body as inert matter, fit for scientific investigation while retaining the Soul/Mind for higher things beyond, thereby escaping empirical/scientific probing. However, after Descartes, Materialism as the new metaphysics began to undermine this version of the Cartesian accommodation, turning the relationship upside down, with Body as Matter becoming the superior category while Mind was/is to be reduced to Matter. In Modern Medicine/Biomedicine, the human being is even conceived as machine, as artefact, no longer a naturally-occurring organism. Dualism in this sense is the rival of Monism which may take the form of either Materialism (when Mind is reduced to Body) or Idealism (Body/Matter is reduced to Mind). For a powerful account of dualism from the standpoint of feminism, see Plumwood, 1993 of which more would be said later. On this ontological volte -face, see Lee, 2012b. With this criticism of dualistic thinking, Lee proceeds to describe dyadic thinking, with the background of contextual thinking. 2. In dyadic thinking, strictly speaking, a term presupposes its opposite. For instance, “cat” implies the class of “non- cat.” An oppositional pair may then be drawn out, namely, cat and non-cat. 3. However, in the real world beyond that of strict logic, the class of non-cat is a very large class indeed, as it includes dogs, buttercups, humans, indeed, virtually everything else in the universe other than cats. 4. In the real world, therefore, depending on the context, that negative category is delimited to say dogs, such as when we are talking about a cat show as opposed to a dog show, or when we discuss the merits of keeping cats as opposed to dogs as pets. How we pick out “the other category” depends on the context, contextualism, in tum, means that the oppositional pair created is not a dualism but a dyadism. 5. Dualism implies permanence, as it is context-independent — hence, men are (in all contexts) superior to Women, mind/soul is superior to body (or body to mind in Biomedicine), humans are superior to non-humans, and so on. Under dyadism, as it is context-dependent, men are superior to women in certain contexts such as, in general, possessing greater physical strength, while women, in general, are superior to men, for example, in grasping nuances in emotional relationships; women can bear children but men cannot, and in this sense, men may be said to be “inferior” to women. Inherent inferiority or inherent superiority is not part and parcel of dyadic but only of dualistic thinking. 6. In dyadic thinking, the two terms in opposition in any one pair—“men”/” women” or “mind”/“body” —simply refer to different clusters of characteristics or functions in any one given context. The difference(s) focused on would not necessarily be carried over to other contexts. For example, a cat can catch mice, a dog cannot; so in the context of exterminating vermin, cats are opposed to dogs and are superior to dogs in this respect. But in the context of animals as pets, dogs and cats are both pets and so are different from and, therefore, opposed to cattle or chickens which are kept and then slaughtered for the market. 7. All oppositional terms, according to dyadism, involve contextualism, and can also be said to involve perspectivism, in the case of particular terms such as “big” /” small,” “above/below,” “tall” /* short.” When judged from a great distance, an object appears small, but nearer, it appears to be much larger. Relative to y; a is tall or above, but relative to z a is short or below. Relative to a chicken, a human is large but relative to an elephant, a human is small. What is above or below, big or small depends on the position of the viewer and the kind of viewer it is, on the distance between the viewer and the viewed, on the value standpoint of the viewer. Other pairings are sweet/bitter or hot/cold: if the person first eats a very sweet piece of milk chocolate, then a piece of dark chocolate, then the latter would taste even more bitter than if it were taken on its own without first having eaten the former and vice versa; if you first plunge your hand in cold water followed by plunging it into hot water, the hot water would feel less hot than it would otherwise be. Take weeping/laughing: we associate Weeping with something sad or tragic and laughing with something happy or funny —yet sometimes the most tragic of circumstances would it not weeping but laughing, and the laughing is to be understood as weeping but in another mode. This simply confirms the claim that perspectivism is context- dependent; hence, the significance of Contextual Thinking as the over-arching framework in the Chinese Mode of Thinking. 8. Perspectivism emphazises that there is a conceptual link between the contrasting terms in the pair— that the concept inside (x) implies that of outside (y), far implies that of near, tall implies that of short, beautiful that of ugly. The concept x could only be properly grasped/understood by relating it to its conceptual contrast y as well as the situation and attitude of the individual in deploying the contrasting terms in the pair. 10. The Yinyang pairing serves to bring out, more strongly than some of the other pairings, that the relationship between yin and yang goes beyond a mere conceptual relationship; chapters 6 and 7 have demonstrated the complicated relationships between them, namely, that empirically, causally, and ontologically, they are inextricably entwined with each other, acting as a harmonious Whole. The pairing and the harmonious Whole are empirically based because processes in Nature exhibit them— day is followed by night, night by day, Winter by Summer, Summer by Winter, heat by cold, cold by heat, life by death, death by life. Yuzou (universe) and Wanwu (especially organisms) repeat this cycle in an enduring manner. The pairing is ontologically grounded because the fundamental category in Yuzhou is Qi and Qi exists and operates in two modes, Qi-in-dissipating and Qi-in-concentrating modes— together they form a harmonious Whole as Em-ism, neither only energy nor ouly matter (to use modern language). Another example comes from the Yao-gua Model of the Yijing. Here s a version of the sequence of the Xiantian gua (according to the Shao Yong) which reads Qian(1), Dui (2), Li (3), Zhen (4), Xun (5), Kan (6), Gen (7), and Kun (8) as shown below. This arrangement shows the trigrams as polar contrasts: the Qian gua occupying South and the Kun gua occupying North; the Li gua East and the Kan gua West, the Zhen gua Northeast and the Xun gua Southwest; the Dui gua Southeast and the Gen gua Northwest. The Houtian (After-Heaven) arrangement (see chapter 5) illustrates the relationship between the trigrams and Wuxing. Here, the Li gua now occupies due South and its polar contrast the Kan gua due North; the Zhen gua due East and its contrast the Dui gua due West; the Gen gua occupies Northeast and its contrast the Kun gua Southwest; the Xun gua Southeast and its contrast the Qian gua Northwest. The trigrams could be arranged differently depending on the context of their application; they could occupy different positions in terms of Timespace—for instance, a different gua than the Qian gua, the Li gua could be used to stand for East/Summer/Heat/Yang depending on context. This accords with the over-arching Contextual Mode of Thinking; its account of polar-contrast pairings is dyadic, not dualistic as according to the latter, the respective status of the superior/privileged/the dominating and that of the inferior/non-privileged/dominated half of the pairing remained hierarchically unchanged, set in stone. Under the Contextual-dyadic Mode, the pairings form a harmonious Whole and so could, therefore, be argued to be a distinctive form of thinking, indeed, unique to Chinese civilisation and its culture. This excerpt isn’t one-quarter of the way through the chapter, yet is enough to give a flavour for the ideal of contextual-dyadic thinking. The next section (11) reinforces “the analysis above by looking at an image of the pro-creation myth in Chinese folklore”. Lee, Keekok. 2017. The Philosophical Foundations of Classical Chinese Medicine: Philosophy, Methodology, Science. Lexington Books. https://rowman.com/ISBN/9781498538886/The-Philosophical-Foundations-of-Classical-Chinese-Medicine-Philosophy-Methodology-Science. For @theNASciences in 1996, #CSHolling clarified definitions of resilience, with engineering seeking one equilibrium state, while ecology recognizes many. DeAngelis, D.L. 1980. Energy flow, nutrient cycling and ecosystem resilience. Ecology 61:764-771. O’Neill, R. V., D. L. DeAngelis, J. B. Waide, and T. F. H. Allen. 1986. A Hierarchical Concept of Ecosystems. Princeton, N.J.: Princeton University Press . Pimm, S.L. 1984. The complexity and stability of ecosystems. Nature 307:321-326. Waide, J. B., and J. R. Webster. 1976. Engineering systems analysis: Applicability to ecosystems. Volume IV, pp. 329-371 in Systems Analysis and Simulation in Ecology, B.C. Patten, ed. Figure 1 Two views of a single, globally stable equilibrium. (a) Provides a mechanical ball and topography analogy. (b) Provides an abstract state space view of a point’s movement toward the stable equilibrium, with x 1 and x 2 defining, for example, population densities of predator and prey, or of two competitors. This is an example of engineering resilience. It is measured by the resistance of the ball to disturbances away from the equilibrium point and the speed of return to it. Dublin, H. T., A. R. E. Sinclair, and J. MeGlade. 1990. Elephants and fire as causes of multiple stable states in the Serengeti-mara woodlands. Journal of Animal Ecology 59:1147-1164. Fiering, M.B. 1982. Alternative indices of resilience. Water Resources Research 18:33-39. Holling, C. S., D. D. Jones, and W. C. Clark. 1977. Ecological policy design: A case study of forest and pest management. IIASA CP-77-6:13-90 in Proceedings of a Conference on Pest Management, October 1976, G. A. Norton and C. S. Holling, eds. Laxenburg, Austria. Walker, B. H., D. Ludwig, C. S. Holling, and R. M. Peterman. 1969. Stability of semi-arid savanna grazing systems. Ecology 69:473-498. Walters, C.J. 1986. Adaptive Management of Renewable Resources. New York: McGraw Hill. FIGURE 2 Topographic analogy and state space views of evolving nature. The system modifies its own possible states as it changes over time from 1 to 4. In this example, as time progresses, a progressively smaller perturbation is needed to change the equilibrium state of the system from one domain to the other, until the system spontaneously changes state. (a) Ball and topography analogy. (b) Equivalent state space representation.